SIG SAUER introduces the SBX Pistol Stabilizing Brace, an update to the SB15 Pistol Stabilizing brace, a shooter's aid that is designed to improve the single-handed shooting performance of buffer tube equipped pistols. The SBX features a more slim design with a thicker strap for extra stability. 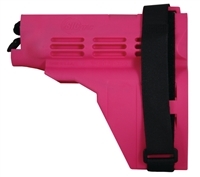 This veteran-designed and U.S.-manufactured accessory enhances accuracy and reduces felt recoil when using an AR-style pistol. 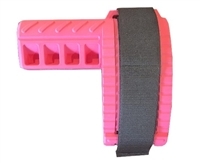 Made from high-quality, elasto-polymer, the SB15 is manufactured to close tolerances and fits all pistols equipped with an AR-style buffer tube 1.0” – 1.2” in diameter. The Pistol Stabilizing Brace uses the operator’s forearm to provide stable support, thereby minimizing accuracy-robbing spin and shift. A flexible cuff with two adjustable nylon straps allows the SB15 to be custom fit to any user.